Introduction by Rabbi Alexander Schindler, then president of the Union for Reform Judaism. Rabbi Marc Lee Raphael Ph.D. is professor of Judaic Studies and Religion at the College of William and Mary and rabbi of Bet Aviv in Columbia Maryland. He wrote this book when professor of history at Ohio State University and ideally situated to explore the three cities where AHS spent his adult life: Cincinnati (education at Hebrew Union College); Wheeling West Virginia (first pulpit); and Cleveland (46 year second pulpit). The book's 50 pages of notes show the author's use of resources in those cities and many interviews with those who knew Abba Hillel Silver. Half the book deals with, in much detail, the tumultuous years 1940 - 48 when Silver devoted himself to the Zionist cause. There is much carefully documented information on his dealings with (and conflicts with) other Zionist leaders, including Stephen S. Wise, Emanuel Neumann, Nahum Goldmann, Chaim Weizmann and Peter Bergson as well as three U.S. presidents: Roosevelt, Truman and Eisenhower. 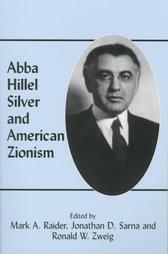 David Dalin's review of this book (Commentary, January 1990) (click here, fee) notes the book's lack of in-depth exploration of Silver's personal and family life and Silver's role in shaping a pro-Zionist policy within the Reform movement, though that policy was to support Israel and those who wish to make it their home, and not to encourage aliyah (moving to Israel). Rafael Medoff, the director of the Wyman Institute for Holocaust Studies, in his review of the book described below regards the Raphael book as "thorough and insightful". The 16 page introduction by Alexander Schindler is eloquent and, in its view of Silver as a modern-day Moses, stirring. References to this book are noted Raphael. It was a surprisingly long time — more than 30 years after his death — before the first academic conference to examine Rabbi Abba Hillel Silver's life and work was held. Six papers presented at that 1996 meeting at Brandeis University are the basis for this book. Editor Mark Raider views Silver's stature as comparable to that of Louis Brandeis, Theodor Herzl and David Ben-Gurion. Given the high cost of this slim volume, these studies may not have had a wide audience outside of scholars who would value their use of "previously inaccessible and unexplored archival material." Here is the book's description on the website of the publisher, Frank Cass. Bringing together, for the first time, several distinguished historians of Zionism and the American Jewish experience, Abba Hillel Silver and American Zionism offers a comprehensive treatment of one of the twentieth century's pre-eminent Jewish political figures. Silver was a champion of American Zionism whose singular role in modern Jewish history and the establishment of the State of Israel has been hitherto neglected. The contributions to this volume are diverse in scope; they are based on previously inaccessible and unexplored archival material. The essays investigate Silver's Zionist political leadership, impact on American Judaism, ideological orientation and relations with the leaders of the Palestine Jewish community, World Zionist Organization and the Jewish state. These papers were also published as Vol. 17, No. 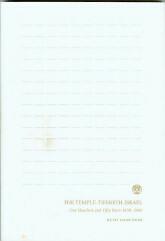 1 (Spring 1996) of the Journal Of Israeli History. Many of its pages are now available as a Google book, but the book is set up for "limited view". A "workaround": set your browser to clear cookies on exiting. After exiting, open your browser again and revisit the link to look at more pages. More on Google books. References to this book are noted RSZ. On the occasion of its coming 150th anniversary The Temple - Tifereth Israel published this book written by its long-time historian Ruth Dancyger. It is a carefully researched and, with 125 photos, extensively illustrated history of the congregation. As Abba Hillel Silver was its rabbi for 46 years — nearly one third of its history — he is mentioned often. References to this book are noted Dancyger. The Defeated Zionist: Abba Hillel Silver and his Attempt to Transcend Jewish Nationalism"
Currently these pages do not refer to this book. 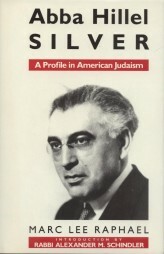 At the April 2010 conference of the Association for the Study of Ethnicity & Nationalism, Professor Shiff presented a paper in English that deals with the core subject of this book: "Abba Hillel Silver and David Ben-Gurion: A Diaspora Leader Challenges the Revered Status of the "Founding Father"